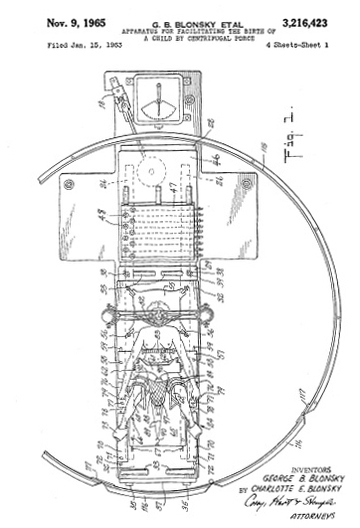 [T]here is provided rotatable apparatus capable of subjecting the mother and the fetus to a centrifugal force directed to assist and supplement the efforts of the mother so that such centrifugal force and her efforts act in concert to overcome the action of resisting forces and facilitate the delivery of the child. . . . Means are provided to assure the safe delivery of the fetus and to stop the machine immediately upon such delivery. These means comprise a pocket-shaped reception net made of strong, elastic material . . . . [The weight of the fetus in said net, once delivered,] causes an electric switch in the control box to stop the drive motor and the rotation of the whole machine.